GP mRNA is co-transcriptionally edited by stuttering, thereby encoding sGP and GP. smal GP is a dimer secreted out of the cell and reduces acquired immune response. This protein may act as a decoy against antibodies or immune cells. Viral RNA-dependent RNA polymerase transcribes the viral genes from the minus strand RNA template. Ebolavirus virion can attach to host DC-SIGN or L-SIGN. Host HAVCR1(TIM1) binds phosphatidylserine (PS) exposed on virion membrane, triggering a intracellular signal that leads to macropinocytosis. 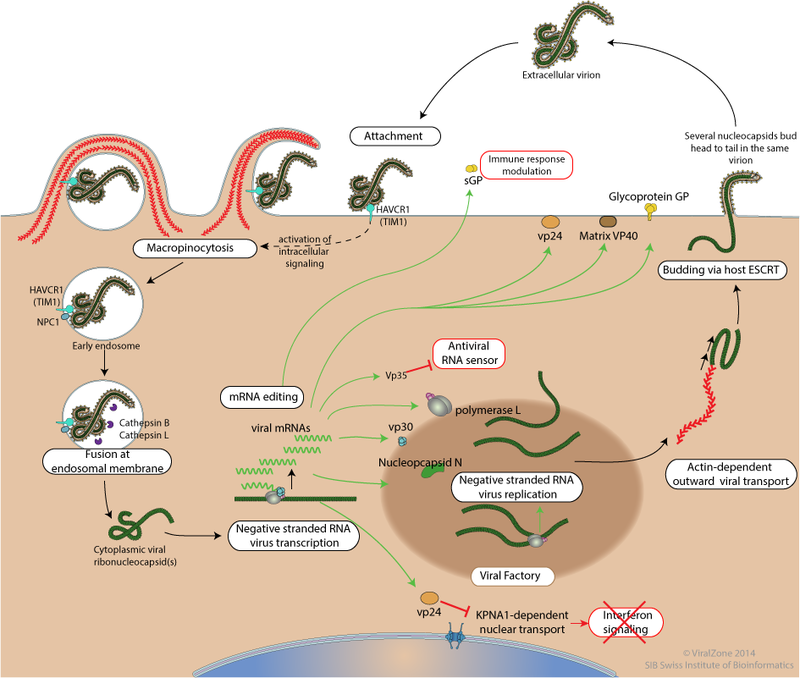 Virion budding occurs at the plasma membrane, and virions can receive several copies of ebola genome. VP35 interacts with host IKKepsilon, thereby preventing host antiviral defense activation by viral RNA pattern recognition. Vp24 inhibits host Interferon signaling, thereby switching off antiviral defenses activated by external cell signaling. Attachment to host receptors through GP glycoprotein like DC-SIGN and DC-SIGNR . Cellular receptor like HAVCR1 (TIM1 ) binds phosphatidyl serine on virion membrane and a signal is transduced into the cell that trigger the macropinocytosis program.